At last, we have local strawberries! J went out to Sakuma Brothers last week and bought our first Skagit Valley strawberries of the season. 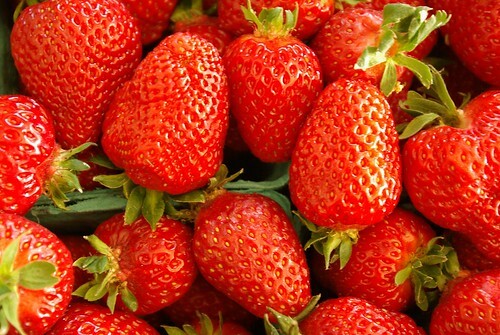 They were huge, juicy and sweet – a totally different animal from the California berries for sale in the grocery store. I know that there are great strawberries in California – we used to buy them at the Santa Barbara farmer’s market every week – but they never make it up here. What did we do with our fresh berries? Apart from eating one every time I walked by the box, that is? 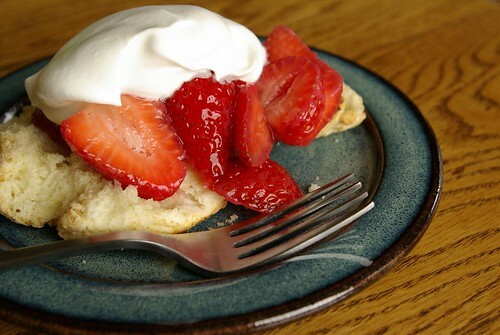 Strawberry shortcake, naturally. Thanks for the info on the ripe local strawberries. One of my favorite ways to enjoying them is to pour a little Hazelnut desert wine over halved berries and let it sit for awhile….yum!